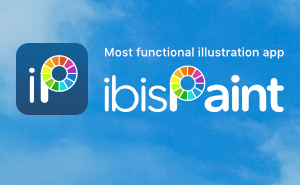 ibisPaint/ibisPaint X ver.5.1.0 is now available. Starting from this version, iPad/iPhone/iPod touch version supports iOS 9.0 or later. Please give us understanding. Android version is the same as Android 4.1 or later. Removed the upper limit of the number of color palettes in Color window. Changed specifications of Magic Wand tool so that Under Line is now off if "Easy Setting" is on. Changed specifications of "Paste" of Selection Area tool so that the pasted image is now not to clipped by selection area. Improved "Paste" of Selection Area tool to keep the position of "Cut" and "Copy". Speeded up playback speed of Blur tool. Added an input screen of a description of artwork on iPad/Tablet. Improved color wheel of Color window to display as a larger for easy to control it on iPad/Tablet. (iPad/iPhone/iPod touch version) Improved the thickness and opacity for pressure sensitivity to be optimum default value for Apple Pencil and 3D Touch. (iPad/iPhone/iPod touch version) Improved the pressure sensitivity so that strong pressure makes bolder and darker, and normal pressure makes specified thickness and opacity. (iPad/iPhone/iPod touch version) Improved Canvas screen of 5.5inch iPhone so that the available area is now wider than 4.7inch iPhone. (Android version) Improved color slides of Color window so that these are now wider and easier to control on the screen of a narrow tablet in portrait orientation. (iPad/iPhone/iPod touch version) Increased the thumbnail size of artwork in My Gallery and Collection screen. (iPad/iPhone/iPod touch version) Changed the width of Preferences screen to the appropriate on the landscape screen in iPad and 5.5inch iPhone. Improved not to fix screen orientation when playing or uploading artwork. The orientation of video created by uploading artwork, sharing a video and saving a video is now fit the orientation of the device instead of the direction of artwork. (iPad/iPhone/iPod touch version) Improved the problem that seems to freeze at the start of step 3 of uploading artwork. Speeded up touch-up processing of Brush tool and Eraser tool with slow devices and large canvas size. Changed the default value of horizontal and vertical padding to 30px on Text tool. (iPad/iPhone/iPod touch version) Improved the push notification to display the notification as the banner at the top of the screen instead of the alert when the app is foreground on iOS 10 and later. Improved Font List window to save the selected tab and the state is reproduced at the next display. (iPad/iPhone/iPod touch version) Changed the default value of the palm rejection to off. 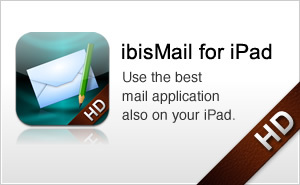 (iPad/iPhone/iPod touch version) Changed the default value of button 1 function of digital stylus to "Palm Rejection". (iPad/iPhone/iPod touch version) Changed the default value of button 2 function of digital stylus to "Undo". Improved to be able to draw from a bit above the quick slider at the bottom of Canvas screen in landscape orientation on phone device. Adjusted Bucket window and Magic Wand window to the same design as the portrait orientation even when it is landscape on phone device. Fixed the size of the window for the tablet. Fixed the design a little. (ibisPaint X only) Enlarged Settings window on phone device because it was displayed slightly smaller on previous version. Improved the disabled text color to a slightly brighter for easy reading when the window color is black. Adjusted the width of Font List window to appropriate because it was too wide in the landscape orientation of phone device. Improved as much as possible to continue playback of broken artwork files. (iPad/iPhone/iPod touch version) Fixed a bug where the app crashes when "Resize" of Canvas tool is selected. Fixed a bug where "Extract Drawing" filter makes a picture to black if it was done twice. Fixed a problem where the restoration by playback is failed by "Failed to initialize the framebuffer:1" error. Fixed a problem where settings of Stabilizer will be changed if artwork is played. Fixed a bug where the width of the thickness slider and alpha slider is not match in the portrait orientation of phone device. Fixed a bug where the size of Settings window will be wrong if the device is rotated during it is displayed on phone device. Fixed a bug where the app crashes when artwork used Ruler is played. Fixed a bug where Quick slider bar will be hidden temporarily when Settings window is displayed and Tool Selection button is tapped while brush type tools (Brush tool, Eraser tool, Smudge tool and Blur tool) is selected. Fixed a bug where Option bar will be hidden temporarily when Settings window is displayed and Tool Selection button tapped while Bucket tool or Magic Wand tool is selected. Fixed a bug where both Tool Selection window and Settings window is displayed if Tool Selection button and Setting button is pushed instantly. (ibisPaint X for iPad/iPhone/iPod touch) Fixed a bug where the window is raised up if Two of Tool Selection button, Setting button, Color button, Layer button are pressed continuously on iPad. Fixed a bug where opacity became too thinner if "Round Brush (Curve)" is selected and "Opacity" is set to 50%, and "Opacity of Edge" is set from 100% to 99% on Eraser tool. Fixed a bug where the result of playback is different if "Force Fade" of Stabilizer is enabled. Fixed a bug where the result of playback is different on constant speed playback. Fixed a bug where the toolbar is left stuck when selecting a material from Material tool window and canceling it an returning to the previous state that Material tool window is displayed when it is portrait orientation on phone device. (Android version) Fixed a bug where Clipping of a layer does not work on some device. (iPad/iPhone/iPod touch version) Fixed a problem where IPV file found alert is displayed on Canvas screen when adding new IPV files by iTunes etc. while the app is suspended and then the app is activated. (iPad/iPhone/iPod touch version) Fixed a problem where the animation of Zoom view is wrong after played atrtwork if the direction of played artwork is different from the direction of device on My Gallery and Collection screen. (iPad/iPhone/iPod touch version) Fixed a bug where canvas size choices where all displayed with the same size on "Import Picture". (iPad/iPhone/iPod touch version) Fixed a problem where extra space is displayed on the top of the keyboard in Canvas Size and Resize of Canvas tool on 5.5inch iPhone. (iPad/iPhone/iPod touch version) Fixed a bug where HEX3 JaJa will not work if Recent Apps is displayed by double-pushing Home button or Notification Center and Control Center are displayed. (Android version) Fixed a problem where uploading a movie file of uploading step 2 is not cancelled correctly. Fixed one of the bugs where the app crashes while playing or restoring artwork. 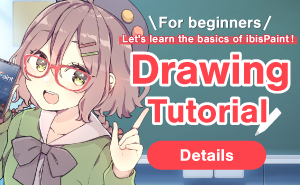 (Android version) Fixed a problem where uploading artwork is failed by an error if uploading artwork is started again after it was cancelled on step 3. Fixed a bug where undo and redo does not work correctly when Undo or Redo button is tapped while drawing with Symmetry Ruler. (iPad/iPhone/iPod touch version) Fixed a bug where importing IPV file from OneDrive app was failed by "Permission denied" error. Fixed a bug where the app freezes when opening the same file of artwork which is failed to open. 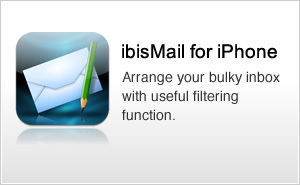 (iPad/iPhone/iPod touch version) Fixed a problem where cannot import IPV file of artwork from Google Drive app. (Android version) Fixed a problem where the toolbar of Canvas screen is hideen by Navigation Bar if Navigation Bar is displayed on FREETEL device. (Android version) Fixed a problem where the layout is broken when a battery warning is display in Canvas screen. (Android version) Fixed a problem where thumbnail images are registered to Gallery app on some Android devices. (Android version) Fixed a bug where the app freezes when buying or cancelling to buy Remove-Ads add-on. (Android version) Fixed a problem where Canvas screen is shifted to the left when the device is rotated to right landscape orientation on Nexus 6 of Android 7.1.1. (iPad/iPhone/iPod touch version) Fixed a problem where the layout of Text Properties window, Canvas tool and Art Information screen are borken if the keyboard is floating state. (iPad/iPhone/iPod touch version) Fixed a bug where "Invalid state" error is displayed when editing, playing, uploading and saving a movie after restoring by the playback or failed to upload artwork on iOS 11. (iPad/iPhone/iPod touch version) Fixed a bug where the left side of vertical texts of Text tool will be cut off on iOS 11. (Android version) Fixed a bug where "Shader Compiling Error(25)" error is displayed when drawing lines by Brush tool on Lenovo YOGA BOOK which is updated to Android 7.1.1. (iPad/iPhone/iPod touch version) Fixed a bug where Browser screen will be displayed twice if the app is launched from the notification. (iPad/iPhone/iPod touch version) Fixed a bug where the app crashes when scrolling a table of Canvas Size Selection screen on the landscape screen. (iPad/iPhone/iPod touch version) Fixed a problem where the pressure sensitivity setting is not updated when available setting of 3D Touch in Settings app is changed after Canvas screen is opened. (Android version) Fixed a bug where the app crashes by the bug of device when uploading artwork or sharing or saving a movie. (Android version) Fixed a problem where cannot import a picture by the bug of device on MONO MO-01J which is updated to Android 7.1.1. (Android version) Fixed a problem where the result of AI Auto Paint is reflected to the outside of the selection area on some Android devices. Fixed typo in alert displayed when deleting downloaded material on Material Tool. Also changed the alignment and label of buttons of the same alert. Fixed an alert message of the confirmation to unregister favorite font. Fixed a problem where Font List window and Material tool window are closed unintentionally when scrolling a table of these window. Fixed an alert message of failing to importing files from other app and downloading artwork files from Online Gallery. Fixed an alert message of shortage storage space. (iPad/iPhone/iPod touch version) Improved a problem where the original thickness (or opacity) of lines does not keep at touchup if Stroke Stabilizer and the pressure sensitivity are enabled. (iPad/iPhone/iPod touch version) Fixed a bug where operation with one finger is mistakenly recognized as operation with two fingers when using Wacom Stylus. Fixed a bug where the color of color button is wrong after the color wheel is changed and dragged the current color on Color window. (Android version) Fixed a problem that IPV file could not be shared unless it was completely restored. (iPad/iPhone/iPod touch version) Ended support for Cregle iPen, Cregle iPen 2, e-pens mobile notes for iPad, MVPen EN309i and Yifang Digital A-pen. (Android version) Ended support for devices of armv5 and armv6 architecture.